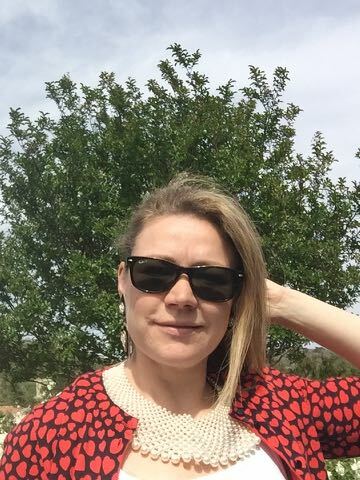 This week I pulled out some earrings that I wear fairly often and paired them with a necklace that I almost never wear. A collar of (faux) pearls is certainly a bit dramatic, but not too difficult to work into my wardrobe. As always, there’s a story behind these pieces. The necklace I found upon a chance encounter at an antique/vintage shop in Hopkins, a suburb of Minneapolis. I went exploring the area – there are a few antique shops in downtown Hopkins. I have to say, I never would have guessed it. Hopkins is a fine place, a middle-class suburb a few miles from Minneapolis, but it’s just about the last place I would have thought to look for anything old and valuable. The shops had mostly knick-knacks and a small selection of furniture, but as the Japanese girl next to me at the display place could tell you, one had some interesting faux pearl jewelry. (She bought a couple of pieces herself.) 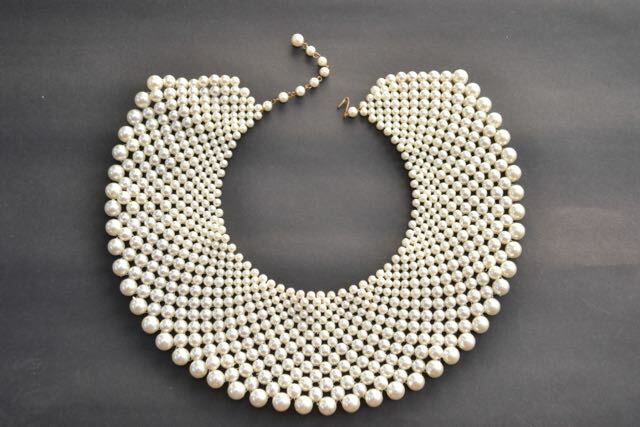 This piece is a web of varying-sized faux pearls, with the largest pearls being on the outside and decreasing in size. It also has an old-fashioned clasp, which I think is a neat detail. It’s perfect to wear on a colored or patterned top. Gives your outfit a little sass, you know? The earrings are more rarified. I bought these Jacky de G vintage earrings from a dealer in Belgium. Actually, there’s a bit more to the story than that. I met Catherine at vintage design fair in Paris and later “followed” her to many of the other vintage design events she shows at, thus discovering wonderful new events! At one of these fairs, or maybe during a private viewing, I found these Jacky de Gs – they’re pure 1980s big, with rhinestones and black velvet and metal back and detailing and were made in France. I found a Pinterest site with several more Jacky de G pieces, if you’re interested in seeing more. Event alert: If you’re planning to be in the Brussels, Belgium area the weekend of April 23+24, you should definitely check out the Brussels Design Market at the Tour & Taxis venue near downtown. 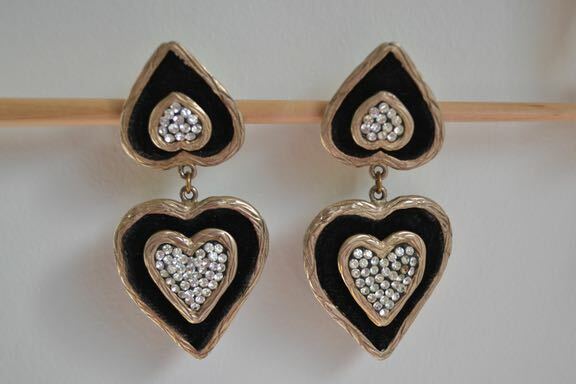 Catherine, who sold me these Jacky de G earrings plus many other fabulous vintage pieces, will be there at Stand 8B. I’ve been to the event and assure you that it’s a lot of fun, not too big and overwhelming, but filled with vintage doodads, furniture, handbags, jewelry, etc.! Bonus: the event is held in a former railroad station, so the architecture is worth seeing all on its own. Pearls are popular in vintage jewelry but they can also be expensive. These faux pearls look great in these vintage styles and they won’t break the bank! Most pearls are also classy and they never go out of style. 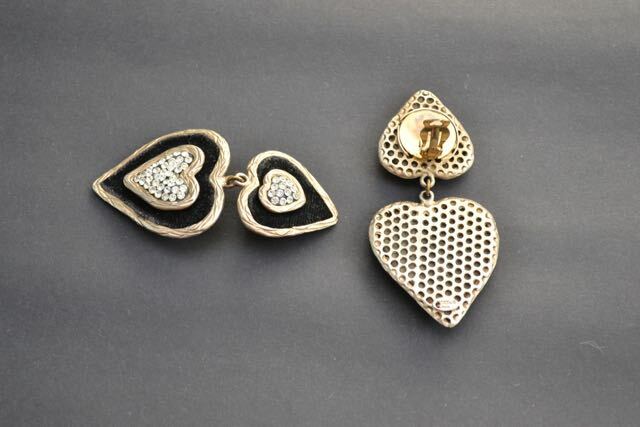 The vintage heart earrings are amazing. How do you know if you are buying something that is really vintage. Have a hard time here. I found a store in San Fran – Lang Antiques (www.langantiques.com) that sells a wide selection of antique jewelry. Still need advice on how to really know something is worth collection. Thanks. Wow! loved the necklace. Looks just like real. Amazing!